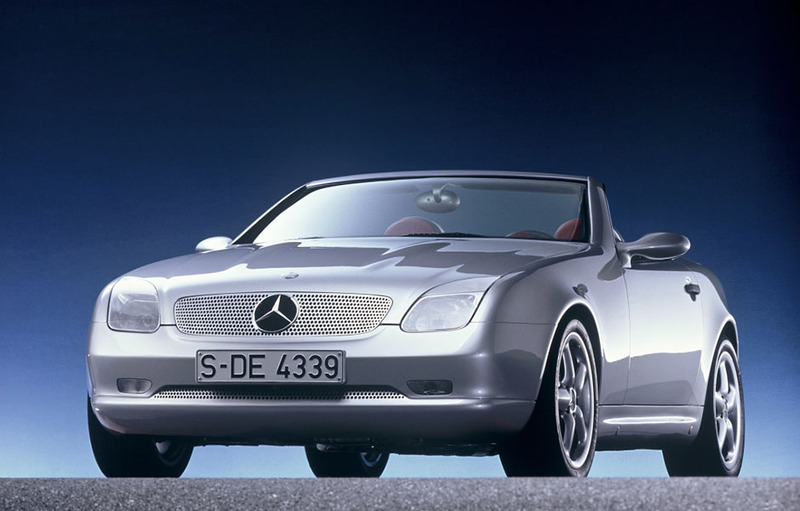 The ‘Studie SLK’ concept car debuted in May 1994 at the Turin Motor Show. The overall design was kept remarkably intact in the production version. 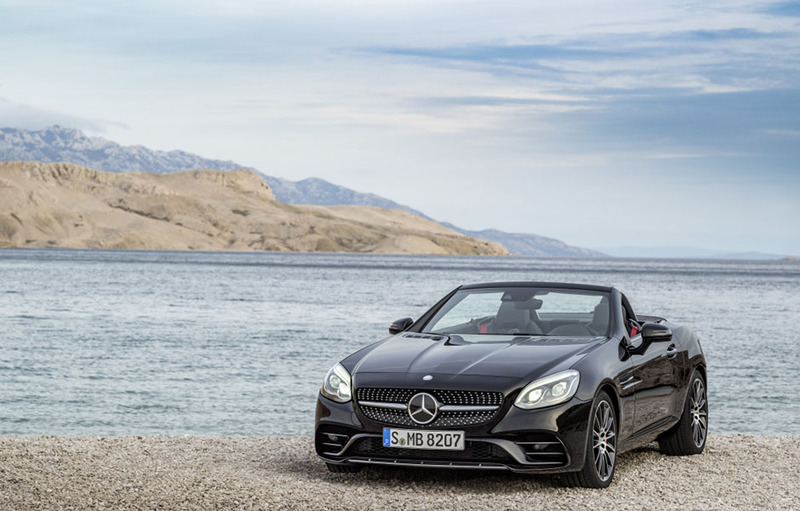 In the spring of 2016 the new Mercedes-Benz SLC inspires an appetite for open-top driving. The compact roadster is the latest installment in a two-decade success story which began in April 1996 with the premiere of the first Mercedes-Benz SLK. The compact roadsters with their characteristic Vario roof paved the way for an entire market segment focusing on open-top driving pleasure throughout the year. Stuttgart. “Innovative” and “attractive” were the buzzwords when Mercedes-Benz unveiled the SLK (R 170) 20 years ago at the 66th Turin Motor Show.The premiere of this compact, two-seater sports car at the end of April 1996 caused a sensation. For the first time, Mercedes-Benz was offering a small roadster positioned below the SL. At the same time, the vehicle set new standards in pioneering engineering and technology. The folding sheet-metal roof drew particular attention from specialists and the general public alike. This Vario roof combined the advantages of a robust hard top with the flexibility of a classic fabric top. The innovative solution was one of the strengths which saw the SLK pave the way for an entire market segment focusing on open-top driving all year round with a sporty touch. Mercedes-Benz had already provided a foretaste of the roadster two years previously, with an SLK study which was also unveiled in Turin. Giorgietto Giugiaro presented designers Bruno Sacco and Peter Pfeiffer with an award for their visionary design in April 1994. 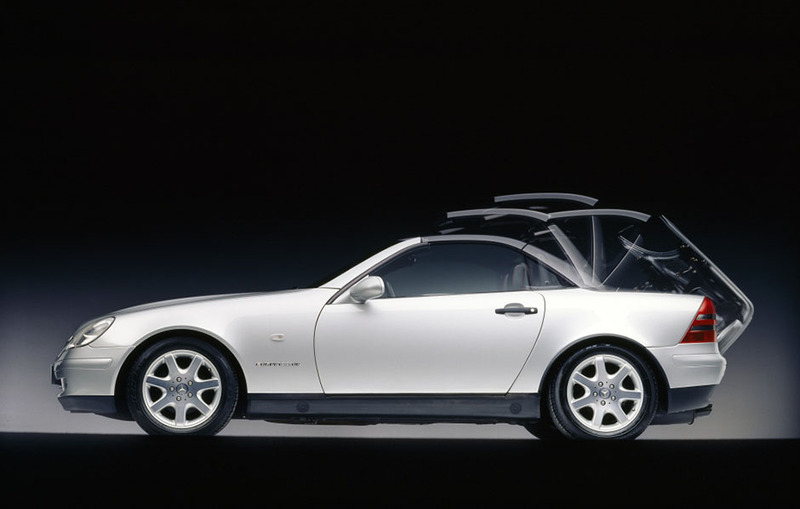 A more advanced SLK study featuring the Vario roof duly followed at the Paris Motor Show in October 1994. The Stuttgart brand’s SLK appealed with great success to a new, lifestyle-oriented category of customers. Sales of the SLK across the three generations covered by the 170, 171 and 172 model series total more than 670,000 to date,with the R 170 which was built between 1996 and 2004 accounting for over 311,000 units alone. Following the introduction of a new nomenclature for the Mercedes-Benz model range, the R 172 has been redesignated the SLC in 2016. This underscores the roadster’s closeness to the Mercedes-Benz C-Class in terms of engineering. This baby SL series debuted new technology allowing a one touch retractable hard top. At its market launch in 1996 the R 170 was available in the SLK 200 and SLK 230 K (supercharged) versions, in addition to which a supercharged SLK 200 K version was available for certain export markets. In 2000 Mercedes-Benz presented the facelifted generation of the R 170. A six-cylinder engine was now available for the first time, on board the SLK 320 (160 kW/218 hp). The new top-of-the-range model was the SLK 32 AMG (260 kW/354 hp), which was available exclusively with a five-speed automatic transmission. From the end of 1995 to the beginning of 2004, some 311,222 vehicles rolled off the production line at the Bremen factory (including the null series). Female customers displayed a particular predilection for the compact Mercedes-Benz roadster, whose Vario roof offered additional safety compared with the classic fabric top as well as increased noise insulation in closed state. The R 170 also boasted special merits in the area of passive safety: in the roadster measuring less than four metres in length, the Mercedes-Benz engineers employed an ellipsoidal bulkhead for the first time. In conjunction with the correspondingly thicker foot padding, this proved particularly effective in reducing peak acceleration forces in a collision. The SLK performed impressively in all relevant crash tests, such as offset, crabbed barrier, roof-drop and roll-over test with open top. It met Mercedes-Benz’s own standards, thereby exceeding the stipulated mandatory requirements. In January 2004 Mercedes-Benz presented the SLK of the R 171 model series. As a compact roadster with Vario roof it embodied the same essential design concept as its predecessor, while featuring a surprise in the form of a front design establishing visual links with the SLR McLaren super sports car and the McLaren-Mercedes Formula 1 racing cars. The choice of models initially comprised the supercharged SLK 200K, the SLK 350 with V6 engine and the SLK 55 AMG, which was the first SLK to feature a V8 engine (265 kW/360 hp). The SLK 280 followed in the autumn of 2005. 2nd generation R171 SLK redesigned incorporating design cues from the Mercedes-McLaren SLR supercar. A special highlight and a world-first in 2004 was the optionally available AIRSCARF, a neck warmer integrated in the seats which emits warm air into the neck area from under the head restraint, thus enabling open-top driving at low temperatures in conjunction with the draught stop. The established Vario roof had now undergone further development: the rear window turned automatically during folding of the roof. As a result, the folded roof took up less space and the luggage compartment volume with open roof rose from 145 litres in the R 170 to 208 litres. The facelift in January 2008 entailed slight modifications to the front and rear sections of the R 171 and revamping of the interior. In 2010 Mercedes-Benz launched the third generation of the SLK – model series R 172. 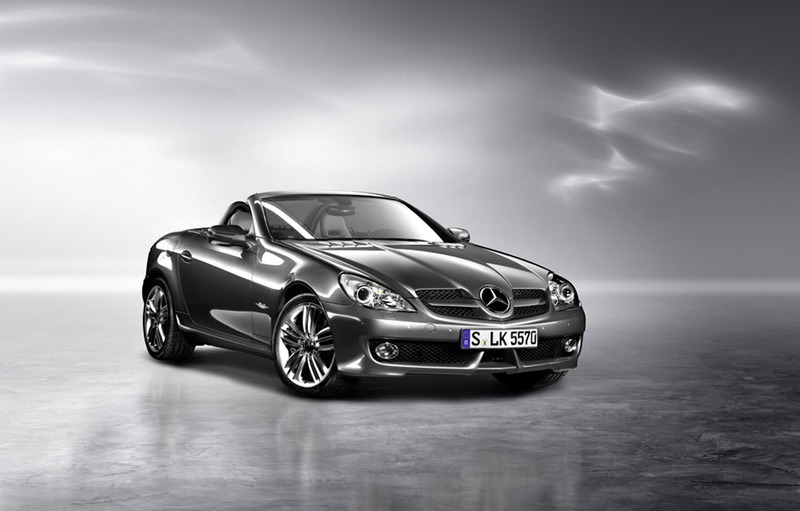 The SLK was now available for the first time with a diesel engine, as the 250 CDI. The new version continued the compact roadster’s success story. As of 2016, the former SLK now goes by the name Mercedes-Benz SLC. Like its predecessors, it is built at the Mercedes-Benz factory in Bremen, alongside the SL within a flexible production set-up. R172 Mercedes-AMG SLC 43 in obsidian black.